According to the reviews they're not that heavy, and glass stuff is usually pretty light. I'd probably get a pair in like 6G or 4G to wear through earskins instead of getting huge ones though. Too bad they've been out of stock forever. Oooh,I like those glass ones pictured above.Are they from bodyartforms?That site has some amazing stuff-I'd never taken the time to really look at the entire site & couldn't understand why everyone fussed over it so much;I think it's cause the way the site's layed out,the pictures of the different plugs kind of stop & it looks like you've reached the end of the section,but there's like,100 more pages of stuff after it.I wear plain single flared steel tunnels 99% of the time,but I <3 the way glass spirals look & wear them every once in awhile,but only for a little bit,cause it seems like no matter what,one will always be a hair smaller than the other.But this is what I don't understand:people are always saying how bad it is to wear regular tapers as jewelry,but it's perfectly fine to wear talons,spirals,or other styles?Some of the reasons as to why straight tapers are bad I don't see why they wouldn't also apply to a hooked or spiral one.Personally,I wouldn't wear straight tapers as jewelry cause they're uncomfortable & knock into everything,but as far as like,they're not uniform thickness throughout & stuff like that,why would it make a difference if they're just a different shape?I'm not trying to argue w/ anyone,like I said,I do wear spirals occasionally,but I'm just not understanding why one is so bad but the other is perfectly fine if they're similar. I think the ones I posted aren't being stocked anymore. They might have similar styles or they might be on another website. BAF has some really amazing stuff if you dig through it all. They have the best selection I've seen, and their jewelry ranges from cheap to the highest quality. But even their cheap stuff doesn't seem as bad as jewelry I've seen from Hot Topic and similar places. Spirals, like tapers, shouldn't be worn in new stretches because they can increase the risk for a blowout if they get knocked around, but either one is fine to wear in a well-settled stretch. 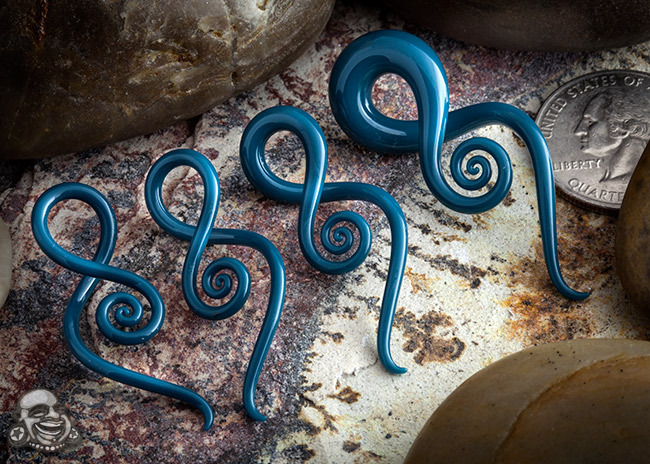 Spirals are also bad to stretch with because the size isn't uniform and you might end up with a thicker part in the front of your lobe than in the back and vice versa. Also, the curved shape can put pressure on the fistula. They're fine for older stretches but I still don't recommend sleeping in them (unless they're very small). They don't make them big enough for me (and if they did they would just be too huge to wear) but I'd like to get a smaller pair and wear them through earskins if they wouldn't fall out too easily. I actually had those and a bunch of other glass hanging designs on my wishlist before I even started stretching but I ended up going bigger than I'd planned. Plus it's just really expensive. Those are so hawt Lindsay. I saw them the other day and was drooling. I can't wait to get to a size I feel like stopping at then I can get all this cool stuff. I know, I NEEED them! I think I might get some on Halloween when BAF has a 30% off code. I can't decide what size to get since I'll be wearing them through earskins. I was thinking maybe 4G but I'm not sure. I'd like the 2G but I don't want them to be down to my shoulders when I wear them! Corazon, I really want a pair of squids too. SO FREAKING HOT! The 2gs are only an 1/8th inch longer and they look a bit more sturdy to me. The lollipop ones are the ones I really want. Yep, I think the code is JACK2012.